Stocks are set to rebound from their worst drop in two weeks Thursday as investors eye data which could help equities decouple from euro zone headlines. U.S. private employers created 133,000 jobs in May, fewer than expected, a report by a payrolls processor showed. Also, new claims for unemployment benefits rose last week for the fourth straight week. The data come ahead of Friday's key payrolls report for May. In other economic news, a report showed the U.S. economy grew at an annual rate of 1.9 percent in the first three months of the year, slower than initially thought. The S&P 500 fell 1.4 percent on Wednesday, its biggest decline since May 17, as anxiety over the euro zone's fiscal crisis sent investors away from riskier assets and into safe havens such as Treasury bonds. The CBOE volatility index, a gauge of market anxiety, jumped 14.8 percent, its largest daily gain in almost three months. European shares steadied, recovering some poise after the previous session's steep losses but were still set for their worst monthly loss since August as concern over Spain's financial problems continued to weigh. The benchmark S&P index is on pace for its worst monthly decline since September on increasing concern over the euro zone's debt crisis and a spate of tepid domestic economic data. Equities have been closely linked to the fortunes of the euro, with the 50-day correlation between the currency and the S&P 500 at 0.92. Expectations of an Irish vote in favor of Europe's fiscal pact helped the euro recover from a near two-year low against the dollar. Retailers will be in focus as they report monthly same-store sales results. Costco Wholesale Corp reported a four percent rise in comparable sales in May, falling short of analysts' forecasts as a strong dollar hurt the value of its sales overseas. TiVo Inc reported a bigger-than-expected quarterly loss and forecast another loss for the current quarter as the maker of digital television recorders fights costly legal battles to protect its patents. Asian shares slid amid concern Spain may fail to rescue its banks due to soaring borrowing costs, compelling it to seek a bailout. May 31 (Reuters) - Toronto's main stock index was set to edge higher at the open on Thursday, but gains were expected to be limited by escalating tensions in the euro zone crisis and weak U.S. economic data. The S&P/TSX composite index was still on track for its worst monthly performance since September 2011. * Europe's leaders must clarify their vision for the euro quickly to dispel doubts about the currency's future, ECB President Mario Draghi said, warning that the Central Bank could not fill the policy vacuum. * Euro zone inflation eased further than expected to its lowest level in more than a year in May, giving the European Central Bank a little more room to lower interest rates amid fears of deep recession across the continent. * Canada's CGI Group Inc agreed to buy Anglo-Dutch IT services firm Logica for $2.64 billion, giving it the scale and geographical presence to meet multinational companies' demands for global IT contracts. * Canadian Imperial Bank of Commerce reported a 6 percent increase in quarterly income, topping estimates, on higher volumes at its retail and business banking operations. * National Bank of Canada said its net profit jumped 69 percent in the second quarter thanks to a one-time gain from an asset sale, and the bank boosted its quarterly dividend by 5 percent. * TMX Group Inc : The consortium of Canadian financial institutions bidding for the operator of the Toronto Stock Exchange extended its C$3.8 billion offer to July 31, it said. * Descartes Systems Group Inc. : The business software provider posted an 18 percent rise in quarterly profit, helped by an increase in its services revenue. * CE Franklin Ltd. : The oilfield production equipment distributor said it will be bought by National Oilwell Varco for about $233.08 million in cash as National Oilwell expands its footprint. * Cenovus Energy Inc. : The oil producer said on Wednesday it won regulatory approval for its third major steam-driven oil sands project, a joint-venture development in which it will test new production technology aimed at getting more tar-like oil out of the ground. Peter Selby responds to Nelson Jones's article Money and Morality. When the St Paul’s Institute, working with JustShare, Penguin Books and the LSE, brought nearly 2000 people into St Paul’s for a public debate on the theme of Michael Sandel’s book, What Money Can’t Buy: the Moral Limits to Markets (see Nelson Jones, NS 25 May) it was because we knew the theme touched a nerve, not because we have an answer to peddle. The Institute has been engaged for some years, as an agency of the Cathedral, in seeking to get into debate with the financial institutions which are its ‘parish’; as such we could hardly think Sandel’s book unimportant, and we were delighted so many others thought the same. That’s not the same as signing up to his thesis about the moral corrosion brought about by the intrusion of the market into all sorts of spheres to which it is not appropriate. Certainly we are signed up to the desire to get people thinking hard about which are the things that should be for sale and which should not be and, as Rowan Williams says in his review of What Money Can’t Buy, to do so on the basis of rational reflection rather than relying in feelings of revulsion when we see certain things getting a price. Nelson Jones in his NS piece wonders whether things have deteriorated from some golden age when money didn’t play the part it now does, and points to many areas where things were much more monetised in the past than they are now. Tellingly, if slightly optimistically, he says we no longer sell people, and however bad the euro crisis gets we still won’t be doing that. There are examples he cites in the ancient world that are at least as unpleasant to think about as some of the examples Sandel gives of the intrusion of market thinking. In my comments in the debate I voiced my own reservations about Sandel’s thinking, so much of which seems to me to address symptoms without digging deeper into causes. When he gives the example of prisoners being able to buy a cell upgrade, and when Nelson Jones points out that that has historical precedent, the deeper issue is not being faced by either of them: the selling off of incarceration as a business is common policy in the USA as it is increasingly in Britain. In the process of creating that market a financial interest is being created in locking people up. That can’t be unconnected with the fact that we in Britain lock up more people than other European countries and that a quarter of the rising number of prisoners in the world – and a third of all incarcerated women in the world, whose number has increased by a sixth in five years – are in the USA. The figures that became a matter of public scandal during the Jubilee 2000 campaign for the relief of unrepayable third world debt showed all too clearly that the escalating power fo financial debt was depriving children worldwide of education, healthcare and life itself. The situation is infinitely worse than either Sandel or Jones portrays: the issue is not the buying and selling of things that should, or should not, be free, or whether people value things they pay for more than things they receive for nothing; in the end it is not about getting people to think more clearly than they do about whether markets should have moral limits though all these questions are important. What really matters is that in everything from the depletion of the planet’s resources to the requirement on Greek citizens to sell their democratic birthright to have their debts rescheduled money is deciding matters of life and death, and doing so more and more. That’s why as a Christian and a theologian I am convinced money has acquired all the characteristics of an idol, aggrandising its power and claiming more and more of people’s lives. And that’s why, because of faith’s commitment to raise fundamental questions about anything that has the potential to be an idol, the St Paul’s Institute will go on engaging that debate at an ever more fundamental level. When it recently commissioned a report on the attitudes of those working in the financial sector (see Value and Values) we learned that most did not think the City should listen more to the Church’s guidance. But we now know, since the Sandel debate came to St Paul’s, that many people do want to know whether pressing economic questions have something to say about the meaning of life and whether those who profess faith are prepared to get involved in relating that faith to those questions. Because, make no mistake, money did not acquire this power by accident. The last four decades, roughly since the massive oil price rises of the early 1970s, have seen vast increases in the amount of money in circulation, and technological advance has multiplied its speed of circulation. In the absence of means of regulating that the dominant policy has been one of deregulation, allowing the power of money to grow with its quantity. The results are not just the life and death issues I have described, but a situation in which all of us, rich or poor, are compelled to worry more and more about money and think more and more about it. The issues of monetary reform, dismissed even by the independent commission on banking and widely ignored, are ones we need to press: just as ‘home ownership’ is a euphemism for housing debt, so ‘fractional reserve’ is now a synonym for debt multiplication: is one of the questions we need to ask about the post-2008 crisis whether the system on which we have relied for money creation for nearly a century fraught with inherent instability? I ask the question not because the Institute has a recipe or a policy to commend, but because it is our passion as a community of faith to ensure that these questions are honestly faced. The Sandel debate, and the Jones response are just a start. Peter Selby is one of the interim directors of the St Paul’s Institute, and author of Grace and Mortgage: the Language of Faith and the Debt of the World. He was until retirement Bishop of Worcester, and Bishop to HM Prisons. U.S. stocks were headed for a positive open Thursday, the last day of a wretched month that saw Treasury yields in the U.S. fall to record lows, while Spain and Greece kept contagion worries front and center. Investors kept markets higher despite modestly disappointing reports on U.S. initial jobless claims and manufacturing, which cast a cloud over hopes that the domestic economy is improving. A report on private sector hiring from payroll services firm ADP showed a gain of 133,000 jobs, less than the 157,000 gain forecast by economists. Additionally, the number of people filing for first-time unemployment benefits in the U.S. rose 10,000 to 383,000 in the latest week, which was higher than the expected 368,000 forecast by analysts. Meanwhile, gross domestic product for first quarter was revised lower to 1.9%. The Dow Jones industrial average, S&P 500 and Nasdaq futures were all up about an hour before the open, although stocks slipped from earlier levels after the ADP report. Stock futures indicate the possible direction of the markets when they open at 9:30 a.m. ET. Germany's unemployment figures along with a decline in eurozone inflation helped lift sentiment in overseas markets. Germany reported an adjusted unemployment rate at a two-decade low of 6.7%. "Any good news coming out of Europe is a positive, so the slightly better than expected German unemployment can give the markets a lift," said David Kelly, chief global strategist at JPMorgan Funds. Kelly also believes the markets have become oversold in May, as the major indexes in both the United States and Europe are down between 6% and 7% for the month heading into the last trading day. Kelly said that any sell-off can open the way for moves higher on relatively modest nuggets of good news. Later Thursday, voters in Ireland are expected to approve more stringent budget rules in a referendum. The struggling country could lose access to additional bailout funds if voters reject the fiscal treaty, so a positive vote could reassure investors. Markets have been nervous that Greek voters could reject austerity measures and force that country out of the eurozone. U.S. stocks also fell sharply Wednesday on heightened concerns about Europe's debt crisis. Investors are still worried about Spain not being able to fund bank bailouts that could reach as much as €100 billion. Yields on 10-year Spanish debt soared to 6.6% Wednesday, but retreated slightly in Thursday morning trading..
CNNMoney's Fear & Greed Index, which measures investor sentiment, remained firmly in "extreme fear" territory where it has been for more than two weeks. World Markets: European stocks were all higher in morning trading. Britain's FTSE 100 rose 0.7%, the DAX in Germany edged up 0.3%, while and France's CAC 40 added 0.6%. In Asia, major indexes closed slightly in the red after recovering from earlier steep losses. The Shanghai Composite shed 0.5%, the Hang Seng in Hong Kong lost 0.3% and Japan's Nikkei closed 1.1% lower. Economy: The latest batch of jobs reports comes before the government's closely-watched monthly jobs report, which is due Friday. Analysts surveyed by CNNMoney expect that the U.S. economy added 150,000 jobs in May, including 12,000 government cuts. The unemployment rate is expected to stay at 8.1%. The Chicago Purchasing Manager Index, which tracks manufacturing activity in much of the Midwest, is expected to come in at 57 for May, up from 56.2 in the month prior. The report is seen an indicator of what will happen with the national reading on manufacturing from the Institute of Supply Management, due on Friday. Foreclosures accounted for for 26% of home sales during the first three months of the year, according to a report released Thursday by RealtyTrac. Companies: Shares of Joy Global fell nearly 1.5% in premarket trading, after the mining equipment maker easily beat forecasts but lowered its guidance. Networking equipment maker Ciena Corp. reported earnings that blew past analysts' estimates and issued a forecast in line with expectations, lifting shares 5.6% in premarket trading. Shares of TiVo fell 5.7% in premarket trading after the DVR maker reported a larger-than-expected quarterly loss after the bell Wednesday. Lions Gate Entertainment fell 3.5% in premarket trading after the film studio reported a net loss for the quarter late Wednesday, citing acquisition costs. Shares of Facebook edged higher in premarket trading after briefly slipping below $28 Wednesday. Currencies and commodities: The dollar lost ground against the euro, the British pound and the Japanese yen. Oil for July delivery rose 11 cents to $87.93 a barrel. Gold futures for June delivery slipped $1.40 to $1,562.00 an ounce. What did big banks learn after the mammoth bailouts of the financial crisis? Why, not that much it seems. That's one powerful takeaway from Bloomberg reporter Bob Ivry's tale of a whistleblower awarded $31 million for exposing widespread fraud at Citibank's mortgage unit. The wrongdoing, which Citi admitted to in a February settlement with the U.S. Justice Department, took place long after the financial giant paid back billions of dollars in bailout money from the U.S. government and Federal Reserve. Read the full report from Bloomberg Markets here. Citi knowingly misled the federal government into insuring thousands of risky mortgages, costing taxpayers nearly $200 million, the Justice Department claimed. This took place "before, during and after the financial crisis, and even into 2012," Ivry writes in the latest issue of Bloomberg Markets magazine. Sherry Hunt a senior manager at the bank responsible for spotting fraudulent mortgages spurred the Justice Department to action when she sued Citigroup last year. The feds joined her case under the federal False Claims Act, which encourage whistleblowers by giving them a 25 percent cut of any court award. In February, Citigroup agreed to pay the government $158.3 million, admitting wrongdoing. The number is just 1.4 percent of the company's 2011 net income, Ivry points out. Hunt's share before taxes and paying her lawyers: $31 million. 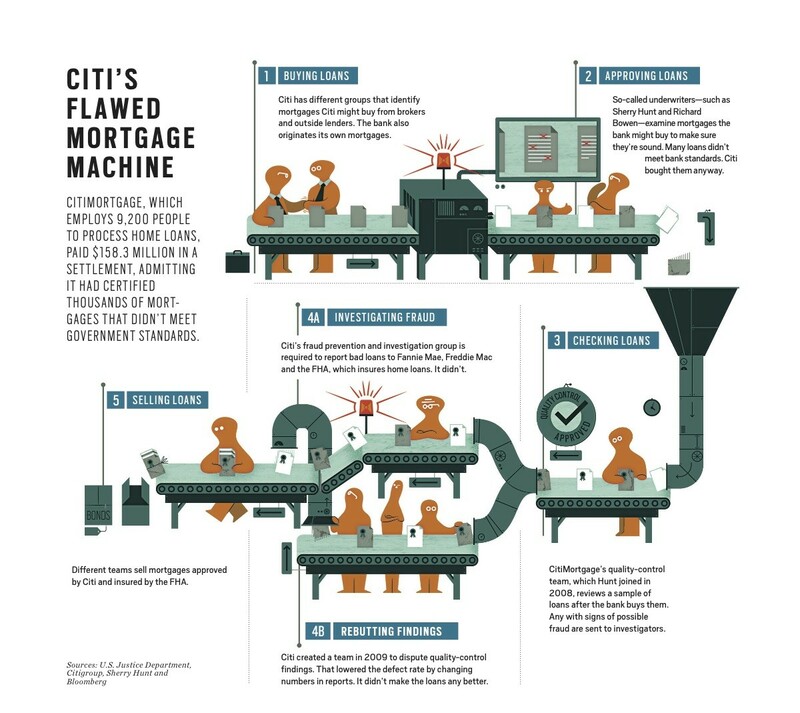 Like many other financial institutions during the housing boom, Citi got a little carried away with mortgages. The bank bought bad loans and then turned around and ignored Hunt's quality control group. In fact, the bank went so far as to create a team to dispute the findings of Hunt's team. That's right, a team inside Citi would flag problematic loans and then another team would essentially de-flag them. The fraud went on long after the crisis. Citigroup behaving badly as late as 2012 shows how a big bank hasn’t yet absorbed the lessons of the credit crisis despite billions of dollars in bailouts, says Neil Barofsky, former special inspector general of the Troubled Asset Relief Program. “This case demonstrates that the notion that the bailedout banks have somehow found God and have reformed their ways in the aftermath of the financial crisis is pure myth,” he says. Hunt is the latest whistleblower to hit the jackpot. On Tuesday, lawyers for former real estate appraiser Kyle Lagow announced he would receive $14.5 million as part of a settlement announced in February between Bank of America Corp. and the Justice Department over claims of mortgage fraud at Countrywide, which was bought by BofA in 2008. NEW YORK, May 31 (Reuters) - U.S. stocks were set for a slightly lower open on Thursday, after data pointed to an economy that may have stalled while investors grapple with the euro zone's debt crisis. A report by private payrolls processor ADP showed private employers created 133,000 jobs in May, fewer than the expected 148,000 while new claims for unemployment benefits rose by 10,000 for the fourth straight weekly increase. The data comes ahead of Friday's key payrolls report. Commerce Department data showed economic growth in the United States was slightly slower than initially thought as gross domestic product was revised down to a 1.9 percent annual rate from last month's 2.2 percent estimate. "The markets have become less optimistic and much more accustomed to seeing numbers that are just not impressive," said Peter Kenny, managing director at Knight Capital in Jersey City, New Jersey. "It is clear the markets are pricing in a substantial slowdown moving forward in terms of GDP growth, employment gains, productivity gains - it's not encouraging for bulls." The S&P 500 fell 1.4 percent on Wednesday, its biggest decline since May 17, as anxiety over the euro zone's fiscal crisis sent investors away from riskier assets and into safe havens such as U.S. Treasury bonds. The CBOE volatility index, a gauge of market anxiety, jumped 14.8 percent, its largest daily gain in almost three months. European shares, which had steadied, turned negative after the U.S data. The FTSEurofirst 300 was off 0.1 percent. The European Central Bank increased pressure for a joint fund to guarantee bank deposits in the euro zone, saying the region needed new tools to fight bank runs as the bloc's debt crisis drives investors to flee risk. U.S. equities have been closely linked to the fortunes of the euro, with the 50-day correlation between the currency and the S&P 500 at 0.92. Expectations of an Irish vote in favor of Europe's fiscal pact helped the euro recover from a near two-year low against the dollar. S&P 500 futures rose 2.1 points and were just below fair value, a formula that evaluates pricing by taking into account interest rates, dividends and time to expiration of the contract. Dow Jones industrial average futures rose 21 points and Nasdaq 100 futures rose 1 point. Other data on Thursday includes the May index of manufacturing activity from the Institute for Supply Management Chicago at 9:45 a.m. (1345 GMT). Economists in a Reuters survey forecast a reading of 56.5 compared with 56.2 in April. Retailers will be in focus as they report monthly same-store sales results. Several top retailers reported stronger-than-expected sales in May, as shoppers overcame growing anxiety about the U.S. economy and the job market. Target Corp advanced 0.7 percent in premarket after posting better-than-expected May same-store sales. Ciena Corp climbed 5.4 percent to $12.49 in premarket after the network equipment company posted a surprise second-quarter adjusted profit. Virgin Money has reduced its maximum loan-to-value for interest-only mortgages from 75 per cent to 70 per cent. The revised policy applies to all decisions in principle generated from May 31. There is no impact on existing customers with interest-only loans. All pipeline applications which have been agreed prior to the new policy will be honoured. Borrowers wishing to use the sale of another property to repay an interest-only loan will only be able to borrow up to 60 per cent of the property’s value. Existing customers wishing to port their mortgage to a new property are able to do so, providing there are no changes to the loan size or the term length. In the past two months, lenders including Santander, ING Direct, Leeds Building Society, Nationwide Building Society and Coventry Building Society have all cut their maximum LTVs from 75 per cent to 50 per cent while Skipton Building Society has cut its maximum LTV from 75 per cent to 60 per cent and The Co-operative Bank has pulled out of this type of lending altogether. Earlier this month, the FSA revealed a number of lenders have asked it to ban interest-only lending as part of the mortgage market review. Ciena (CIEN), the networking equipment company, reported Thursday second-quarter adjusted net income of $3.7 million, or 4 cents a share, a reversal from a year-earlier loss of $22.4 million, or 24 cents a share. Ciena posted second-quarter revenue of $477.6 million. On average, analysts expected the company to post a fiscal second-quarter loss of 3 cents a share on revenue of $447 million. Shares of Ciena rose 6.73% to $12.68 in premarket trading Thursday. TiVo (TIVO) on Wednesday posted weak first-quarter results and second-quarter guidance. The digital video recording company posted a loss of 17 cents a share on revenue of $67.8 million. Service and technology revenue came in at $54.5 million. Analysts were expecting a loss of 15 cents a share on $54.89 million in service and technology revenue. For its fiscal second-quarter, TiVo said it expects service and technology revenue to be between $53 million and $55 million and projects a net loss of $28 million to $30 million. Analysts expect revenue of $56.5 million and a loss of $27 million. Shares of TiVo fell 3.5% to $8.64 in premarket trading Thursday. Joy Global (JOY), the mining equipment maker, reported second-quarter net income of $213.6 million, or $2 a share, up from year-earlier earnings of $162 million, or $1.52 a share. Analysts anticipated the company would report earnings of $1.94 a share. "Aftermarket demand flows to shipments in two months, on average," CEO Mike Sutherlin said in a statement. "The current softness in the U.S. aftermarket orders is not expected to be completely offset by strength in the international markets, and therefore the aftermarket bookings rate is expected to adversely impact revenues by $100 million for 2012." Joy Global said its fiscal 2012 earnings are expected to be negatively impacted by 18 cents a share. Shares of Joy Global fell 1.78% to $58 in premarket trading Thursday. US Airways (LCC) and private-equity firm TPG Capital may join forces to bid for AMR, the parent of American Airlines, Reuters reported, citing people familiar with the discussions. Retailers, including Gap (GPS), Target (TGT) and TJX (TJX), will be reporting same-store sales for May on Thursday. First out of the gate was Costco (COST), which said same-store sales in May rose 4%. Analysts were expecting sales to rise 4.3%. Shares of Costco ticked down 81 cents, or 0.94%, to $85 in premarket trading Thursday. Zumiez (ZUMZ) saw the biggest increase in same-store sales in May, according to Thomson Reuters. The sports apparel retailer reported a sales increase of 13.7%; analysts expected a 6.6% rise. Limited Brands (LTD) had a consolidated same-store sales increase of 6%, beating analysts' estimates of a 4.7% gain. Limited Brands shares ticked up 7 cents, or 0.15%, to $45.91. Macy's (M) squeaked by analysts' May same-stores sales estimates with a 4.2% rise compared to the 4% estimate. NEW YORK (AP) -- Total U.S. money market mutual fund assets fell by $5.35 billion to $2.563 trillion for the week that ended Wednesday, the Investment Company Institute said Thursday. The online service Bankrate.com said its survey of 100 leading commercial banks, savings and loan associations and savings banks in the nation's 10 largest markets showed the annual percentage yield available on money market accounts was unchanged from last week at 0.13 percent. The North Palm Beach, Fla.-based unit of Bankrate Inc. said the annual percentage yield available on interest-bearing checking accounts was unchanged from the week before at 0.06 percent. Bankrate.com said the annual percentage yield on six-month certificates of deposit was unchanged from the previous week at 0.22 percent. The yield on one-year CDs was also unchanged at 0.33 percent. It was flat at 0.53 percent on two-and-a-half-year CDs and steady at 1.13 percent on five-year CDs.